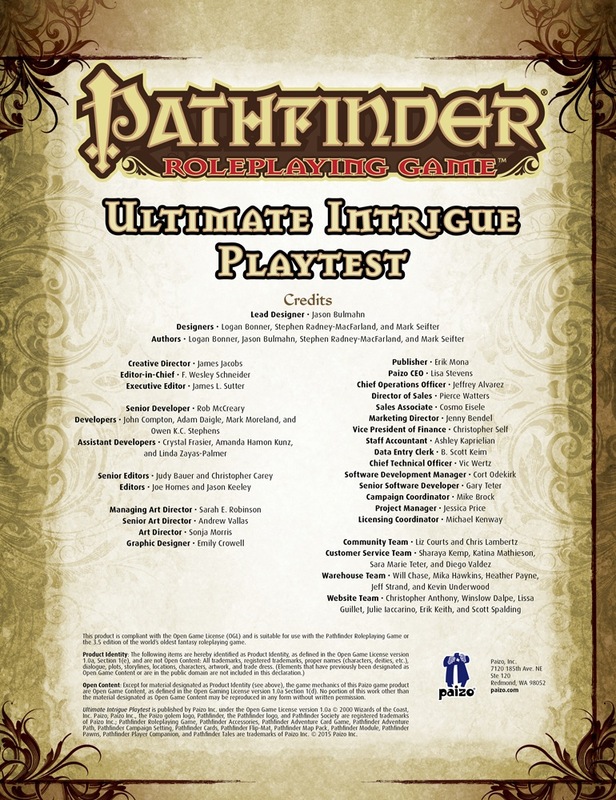 Recently, Paizo unveiled the public playtest for the Vigilante class. The vigilante (a part of the upcoming Ultimate Intrigue) is a bold new design direction for Pathfinder, introducing the concept of a modular class that through detailed customization during character creation can fill any number of roles in the party. 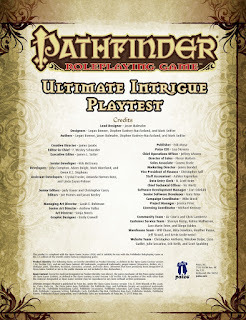 Last year, when Paizo unveiled the Advanced Class Guide the Encounter Table took a couple of stabs at hybrid classes. Just like last year, the Encounter Table is taking a stab at modular class design with the scion class! What you'll find below is a wholly new modular-style class that was conceived, designed, and edited in a span of just two days. The scion is an exercise in seeing what modular class building can be for Pathfinder and also served as a mental exercise in class design and concepting. The scion is a leader or leaders destined to step to the forefront of a society or organization they lead. Maybe you'll have a scion at your table soon! If you use the scion in your games, let us know what you think in the comments section! In every generation there are those who rise to the occasion of leadership, be they a noble king, a tribal elder, a high priest, or some other title. These paragons of their communities and societies command respect and are renowned as just kings, cruel tyrants, and all measures in between. Scions are preternaturally gifted individuals possessed of a singular ability to command the will of others as both leaders and representatives. No two scions are the same; a scion of nobility navigates courtly intrigue, a scion of nature understands the delicate balance of the natural world and the supernatural forces that govern it, a scion of faith leads the masses of his religion and understands its most obscure tenets. Regardless of their origin, a scion is likely to be remembered for generations to come in the history books of their culture—be it as a hero or a villain. Role: A scions is a natural leader, commanding abilities based on the culture she represents. As such, different scions can fill different roles in a party. Generally, a scion is not a front-line combatant, but rather shares her expertise with her adventuring party and helps her allies use their own abilities to a greater extent. Some scions, depending on their origin, may gain greater combat ability or even limited spellcasting power. The scion’s class skills are Bluff (Cha), Craft (Int), Diplomacy (Cha), Intimidate (Cha), Knowledge (history) (Int), Knowledge (local) (Int), Perception (Wis), and Sense Motive (Wis). The following are class features for the scion. Weapon and Armor Proficiency: A scion is proficient with all simple weapons and light armor (but not shields). Affinity: At 1st level a scion gains access to an ability related to the nature of the scion's origin called an affinity. An affinity is chosen from the list of available affinities detailed in the scion's origin. A scion gains an additional affinity at 2nd level, and another at 4th level and every 3rd level thereafter. Once an affinity is chosen it may not be changed. Origin: At 1st level a scion chooses their origin, representing the community they were trained in and the type of society that they exemplify as they grow in levels. A scion's origin determines the nature of her affinities and also grants additional class skills. Class skills granted by an origin may also be modified by the guidance ability. A scion's origin may not be changed once chosen. Additionally, a scion may spend a full-round action directing the actions of his allies in battle. Doing so grants a competence bonus to either attack rolls, saving throws, or skill checks equal to the bonus conferred by inspiring leadership to all allies in 60 feet who can hear and see the scion. The scion may maintain this bonus each round after the first by spending a move action to continue to direct her allies. The scion may change what checks are modifier by her inspiring leadership ability each round as a free action at the beginning of her turn. If you are using the mass combat rules from Pathfinder RPG Ultimate Campaign a scion adds their inspiring leadership bonus to the total DV and OM values of any unit they are a part of. Determination (Ex): At 1st level a scion is capable of pushing herself or others to succeed at any given task. She gains a number of points of determination equal to 3 + 1/2 your scion level (minimum +1). Determination fuels the scion's guidance ability and origin affinities. A scion's determination replenishes at the start of each day. Guidance (Ex): At 1st level a scion may expend 1 point of determination as a free action to modify a Bluff, Diplomacy, Intimidate, or Sense Motive check by 1d6. This ability increases to 1d8 at 5th level, 1d10 at 10th level, and 1d12 at 15th level. A scion may expend 2 points of determination as an immediate action to instead grant this bonus to an ally within 30 feet that she can see and hear who is attempting one of the listed skill checks. A scion's origin adds additional skills that may be influenced by guidance. Tactician (Ex): At 2nd level, a scion receives a teamwork feat as a bonus feat. She must meet the prerequisites for this feat. As a standard action, the scion can grant this feat to all allies within 30 feet who can see and hear her. All allies retain the use of this bonus feat for 3 rounds plus 1 round for every two levels the scion possesses. Allies do not need to meet the prerequisites of these bonus feats. The scion can use this ability once per day at 2nd level, plus one additional time per day at 5th level and for every 5 levels thereafter. Bonus Feat: A scion gains a bonus teamwork feat at 3rd level and an additional bonus teamwork feat at every 3rd level thereafter. Some scion affinities add additional types of feats that may be chosen as bonus feats. Master Tactician (Ex): At 15th level, the scion receives an additional teamwork feat as a bonus feat. She must meet the requirements for this feat. The scion can grant this fear to her allies using the tactician ability. Whenever the scion uses the tactician ability, she grants any two teamwork feats that she knows. She can select from any of her teamwork feats, not just her bonus feats. Legendary Scion (Ex): At 20th level a scion's leadership and renown is a thing of myth and legend, doubling her total number of followers gained from Leadership. The scion also regains a point of determination whenever she succeeds at a skill check with a DC of 30 or higher. Additionally, she may roll an additional guidance die and take the highest result among the dice rolled. A scion of nobility comes from the blood of sovereigns that rule entire nations. While possibly an heir to an empire or kingdom, some noble scions are from exiled families deposed by ruthless tyrants, or refugees from a fallen kingdom. Other noble scions trace their ancestry back to rulers thousands of years removed, yet have been groomed to one day assume their family's rightful mantle. Class Skills: A scion of nobility adds Knowledge (nobility) and Ride to her class skills. A scion of nobility may choose from the following affinities. Affluence (Ex): Whether you have wealthy parents or a secret benefactor seeking to aid your rise to power, someone has a vested interest in your success and is willing to commit gold to your cause. At each level you gain a stipend of gold through direct or indirect means (the details of which are up to the GM) equal to 250gp x your scion level. If you choose this ability at 1st level you apply the stipend to your starting gold. Banner (Ex): When you fly the banner of your family, others are inspired. You gain the banner ability of a cavalier equal to your scion level. Blood of Kings (Su): There is otherworldly power in your blood from somewhere in your ancestry, allowing you to use your blood to enhance certain effects. Once per day, if you are capable of casting spells, you may draw your own blood as part of casting the spell (this adds a somatic component to any spell cast if it does not already have one) inflicting up to 1 point of damage per scion level. For every 5 points of damage inflicted you may increase the caster level of the spell being cast by 1, to a maximum number of additional caster levels equal to your Charisma bonus. Additionally, if you are willing or helpless, an adjacent spellcaster can tap into the power of your blood by inflicting damage to you as part of casting a spell (adding a somatic component to the spell as described above), granting the same bonus to caster level as you would normally gain. You must be at least 5th level to choose this affinity. Booming Voice (Ex): You can shout your commands further than normal, doubling the range of your inspiring leadership ability. Chevalier (Ex): You gain proficiency with all martial weapons, heavy armor, and shields (except tower shields.) Additionally, you count as a fighter of a level equal to your scion level -4 for purposes of qualifying for feats. Courtly Recovery (Ex): Whenever you would fail a Bluff, Diplomacy, Intimidate, or Sense Motive check you may spend 1 point of determination to reroll that check. Great Leadership (Ex): You attract twice the number of followers with your leadership feat. You must be at least 12th level to take this affinity. Heir of High Society (Ex): While in a settlement with an alignment within one step of your own, NPCs who represent the legitimate authority of that settlement (city watch, militia, government officials, etc.) have their starting attitude toward you increased by one step. At 7th level, if the settlement's alignment completely matches your own, eligible NPCs have their starting attitudes increased by two steps. Power in a Name (Ex): When using guidance to modify a Bluff, Diplomacy, or Intimidate check you may roll the bonus dice from guidance twice and take the higher result so long as you invoke your origin ancestry as part of making the check. Quell the Masses (Ex): You may spend a point of social grace to attempt to break the spirits of your enemies. Perform an Intimidate check to demoralize foes as a full-round action against all opponents within 30 feet that can hear you. You may choose to not apply the shaken condition to some of the creatures you successfully demoralize and instead modify their attitude. You can choose to modify the attitudes of a number of creatures equal to your Charisma bonus and their attitude stays modified for 1d6 minutes + one minute per scion level. You may use this ability once per day, plus one additional time per day for every 3 scion levels you possess. Supreme Authority (Sp): You may spend a point of determination to use command as a spell-like ability. Treat your scion level as your effective caster level. At 10th level you may instead use greater command as a spell-like ability. Valiant Defense (Ex): As a standard action you may defend one ally within your reach, granting them a deflection bonus to their Armor Class equal to your Charisma bonus. If this ally is your cohort you increase this bonus to AC by an amount equal to your inspiring leadership bonus. At 15th level you may use this ability as a move action instead of a standard action. You must be at least 5th level to select this affinity. Scions of war are groomed from a young age to take to the field of battle and command armies. These scions are a blend of front-line combatant and tactician, capable of leading a battle from the front. A scion of war has known conflict her entire life and is destined not only for great things, but great bloodshed as well. Battle follows a scion of war whether she seeks it or not, and these individuals are often times unable to escape a life of violence and warfare. Class Skills: A scion of war adds Knowledge (engineering) and Ride to her class skills. Body of War (Ex): You gain Improved Unarmed Strike as a bonus feat. Additionally, you deal unarmed damage as a monk of your scion level. Bulwark (Ex): You are efficient in the use of armor. While you are using inspire leadership, you lower the armor check penalty and increase the AC bonus of one suit of armor or shield you are wearing by an amount equal to half your inspiring leadership bonus. If you spend one point of determination you increase this modifier for one ally to that of your full inspiring leadership bonus for one round. Bypass Defenses (Ex): You may spend one point of determination as a swift action while making a melee or ranged attack to ignore a number of points of your opponent's damage reduction equal to twice your inspiring leadership bonus. Clear the Path (Ex): You may make one overrun attempt as part of a charge attack to move through an enemy's square to reach the target of your charge. You suffer double the normal penalty to AC from charging when you use this affinity. If you fail this overrun attempt you may still make your charge attack on the enemy that blocked your movement. At 5th level, and every 5 levels thereafter, you may make an overrun attempt against one additional enemy in your path. Combat Prowess (Ex): You may take combat feats as well as teamwork feats as your scion bonus feats. Additionally, you add your inspiring leadership bonus to your Combat Maneuver Bonus and Combat Maneuver Defense, even when not actively sustaining the ability. Focused Strike (Ex): You may spend one point of determination as a free action to gain a +1 competence bonus on all your attack rolls for one round. This bonus increases by +1 for every 5 levels to a maximum of +5 at 20th level. Graceful Critical (Ex): You may spend one point of determination when you critically threaten an opponent to add your guidance die to your critical confirmation roll. You must use this ability before you make your critical confirmation roll. You must be at least 7th level to take this affinity. Siege Commander (Ex): You may spend one point of determination to double the bonus on attack rolls granted by your inspiring leadership to any attack roll made with a siege weapon. Shake it Off (Ex): You may spend one point of determination on your turn to remove the confused, dazed, staggered, or stunned condition from yourself. You must be at least 12th level to take this affinity. Stalwart (Ex): When you must make a Fortitude save you may spend one point of determination to add your guidance die to your saving throw result. You must choose to use this ability before you make your saving throw. Ravage (Ex): When you confirm a critical hit on an opponent, you may spend one point of determination as an immediate action to lower their AC by an amount equal to your inspiring leadership bonus for 1 round. You must be at least 10th level to select this affinity. Weapon Training (Ex): You count your scion level as fighter levels for purposes of qualifying for feats. You also receive the weapon training class feature as a fighter equal to your scion level. You must be at least 7th level to take this affinity. A scion of faith has a powerful tie to religion, be it that she was raised by a church from youth or was touched by divinity at an older age. Faith is both a tool and a source of power for this scion, granting her the ability to heal injuries, protect herself and others, and even cast divine spells. Scions of faith aspire to lead their religion into a new age through deeds and legacy. Class Skills: A scion of faith adds Heal and Knowledge (religion) to her class skills. A scion of faith may choose from the following affinities. Divine Scion: When you take this affinity you gain the ability to cast divine spells from the cleric spell list. You cast and your spells as an oracle and determine your number of spells known and spells per day based on the table below. However, you may only cast spells of up to 2nd level. Spells of 3rd level and higher are not considered to be on your class spell list. You use your Charisma to determine the highest level of spells you are capable of casting (unless your affinities limit this further), as well as the DCs of your spells, and bonus spells per day. Like a cleric, you require a divine focus (typically a holy symbol of your faith) to cast most divine spells. Divine Weapon (Su): You may spend one point of determination as a swift action to grant a weapon you wield the holy (if good-aligned) or unholy (if evil-aligned) weapon property for one round per point of Charisma bonus. If you are neutral you must choose whether this ability grants the holy or unholy weapon property when selecting this affinity. You must be at least 5th level to choose this affinity. Domain: You gain one domain (or subdomain) normally granted by your deity. You treat your scion level as your cleric level for purposes of domain powers. Any bonus spells granted by your domain are added to your spell list and spells known provided they are of a level you can cast. Faith Healing (Su): You may spend a point of determination to touch a creature as a standard action and heal them, provided they are of your religion. This ability heals 1d6 points of damage for every 3 scion levels you possess. Greater Divine Scion: You increase your ability to cast divine spells. You gain the ability to cast up to 4th level cleric spells as appropriate for your scion level. Spells of 5th level and higher are not considered to be on your class spell list. This affinity modifies divine scion. You must be at least 7th level to take this affinity. Mercy (Su): You gain the mercy ability of a paladin, save that you may remove the associated status effect as a standard action that costs one point of determination rather than as a part of lay on hands. If you have the faith healing affinity you may use mercy as part of using faith healing, without expending an additional use of determination. Your effective paladin level is equal to your scion level -4. When you take this affinity you may select one mercy available based on your effective paladin level. You may take this ability multiple times. Each time you may select a new mercy available to you. You must be at least 7th level to choose this affinity. Prayer Leader (Su): By expending one point of determination as a standard action you increase the power of one divine spellcaster within 30 feet that can see and hear you. The target of prayer leader gains a bonus to their effective caster level equal to half your inspiring leader bonus (minimum +1.) If the divine spellcaster worships the same deity as you, you do not need to spend determination to use this ability. You may use this ability once per day, plus one additional time per day at 7th level and every seven levels thereafter. Sacred Blast (Su): As a standard action you may hurl a blast of energy as a ranged touch attack with a range of 30 feet. You choose one type of energy when you take this affinity (acid, cold, electricity, or fire.) Sacred blast deals 1d6 points of energy damage + 1 additional point every 3 scion levels. If you spend one point of determination when you use this ability it instead deals 1d6 points of energy damage for every 2 scion levels you possess and half of the damage is your chosen energy type, while the other half is divine damage and not subject to energy resistance. You may use this ability a number of times per day equal to 3 + your Charisma modifier. Shepherd of the Masses (Ex): You may expend one point of determination as part of activating your inspiring leadership ability. Every creature affected by your inspiring leadership gains a +10 enhancement bonus to their land speed and may ignore the effects of difficult terrain for 1 minute per point of your Charisma bonus or until you cease maintaining inspiring leadership. Allies who move out of range of your inspiring leadership prematurely end this effect for themselves. Shield the Masses (Su): By spending 10 minutes in prayer and using one point of determination you can bestow divine protection on a number of creatures equal to twice your Charisma bonus. You may either grant your allies a morale bonus on Will saving throws versus fear, Fortitude saves versus disease, or Reflex saves versus traps equal to your inspiring leadership bonus. This protection lasts for 10 minutes per scion level. You must be at least 5th level to select this affinity. Summon Servitor (Su): You gain the service of an extraplanar representative of your deity. This servitor acts as an unchained summoner's eidolon and must be of an outsider subtype with an alignment within one step of both you and your deity. You treat your effective summoner level as your scion level -5 for purposes of your servitor's strength and abilities. A divine scion's servitor does not gain an eidolon's evolution pool, link, or share spells abilities. Summoning your servitor requires 1 hour of uninterrupted prayer which may be performed during the hour in which you regain your spells during the day. You can dismiss your servitor as a standard action. The servitor otherwise functions identically to an unchained summoner's eidolon. You must be at least 7th level to choose this affinity. True Divine Scion: Your ability to cast divine spells becomes as powerful as possible for a scion. You may now cast divine spells from the cleric spell list of up to 6th level, as appropriate for your scion level. Spells of 7th level and higher are not considered to be on your class spell list. This ability modifies greater divine scion. You must be at least 13th level to take this affinity. Scions of nature are often raised within druid enclaves or fringe communities of fey. Detatched from urban societies, they command the respect and adulation of the wilderness and animals, building kingdoms of forests and fortresses of mountains. Scions of nature assume leadership positions among groups of dedicated rangers, druids, and shamans while using their abilities to tap into the natural world. Class Skills: A scion of nature adds Knowledge (nature) and Survival to her class skills. Weapon and Armor Proficiency: A scion of nature gains no additional weapon or armor proficiencies. A scion of nature may choose from the following affinities. Animal Shapes (Su): You may transform into an animal as a standard action as per beast shape I for one hour per scion level per day. Changing back to your original form is a move action. The duration of this ability need not be used consecutively but must be used in one hour increments. At 13th level this functions as beast shape II, and beast shape III at 19th level. You must be at least 4th level to choose this affinity. Animal Trainer (Ex): You gain Handle Animal as a class skill and may use guidance to modify checks with this skill. Additionally, your inspiring leadership ability functions on creatures of the animal type, regardless of their Intelligence score. Circle Magic (Su): You may initiate and lead a special kind of ritual spellcasting known as circle magic. You may perform circle magic with a number of divine spellcasters equal to your Charisma bonus. When you perform circle magic, all spellcasters involved must join hands with one another to form a complete circuit. The circle leader is designated at the start of the ritual and must possess the circle magic affinity or coven hag ability (or witch hex.) The circle leader chooses a spell she knows to cast, and increases its casting time by 1 hour per spell level. Each additional participant in circle magic beyond the circle leader sacrifices a prepared spell or spell per day (or any number of spells prepared or spells per day) totaling the level of the spell being cast by the circle leader. If at any time any participant in circle magic fails a Concentration check to maintain casting the spell, the spell fails and spell being cast is lost. At the end of the casting time, the circle leader casts her chosen spell and increases the spell's effective caster level by the number of participants in the circle. You must be at least 10th level to choose this affinity. Greater Nature Magic: You increase your ability to cast druid spells. You gain the ability to cast up to 4th level druid spells as appropriate for your scion level. Spells of 5th level and higher are not considered to be on your class spell list. This affinity modifies nature magic. You must have the nature magic affinity and be at least 7th level to take this affinity. Nature Bond: You gain the nature bond ability of a druid equal to your scion level -4. This ability must take the form of an animal companion, chosen from the list of available druid animal companions. You must be at least 7th level to take this affinity. Nature Magic: When you take this affinity you gain the ability to cast divine spells from the druid spell list. You prepare and cast your spells as an oracle, and your druid spells are based on your Charisma score. You determine your number of spells known and spells per day based on the tables below. However, you may only cast spells of up to 2nd level and spells of 3rd level and higher are not considered to be on your class spell list. Nature's Lure (Sp): By spending one point of social grace you may alter the attitude of any creature of the animal, fey, or plant type as if by charm monster. You may use this ability once per day, plus one additional time per day at 15th level. You must be at least 7th level to choose this affinity. Nature's Warrior (Ex): You gain proficiency with medium armor as well as scimitars, shortbows, composite shortbows, longbow, and composite longbows. True Nature Magic: Your ability to cast druid spells becomes as powerful as possible for a scion. You may now cast divine spells from the druid class list of up to 6th level, as appropriate for your scion level. Spells of 7th level and higher are not considered to be on your class spell list. This ability modifies greater nature magic. You must have the greater nature magic affinity and be at least 13th level to take this affinity. Wild Empathy (Ex): You gain the wild empathy ability as a druid of your scion level. Whispers in Wood (Su): You may speak with plants for up to one minute per day per scion level. This duration need not be spent consecutively, but must be used in one minute increments. Woodland Stride (Ex): You gain the woodland stride druid class ability. At 10th level you may confer this ability on one ally within 30 feet per point of your Charisma bonus. You must be at least 4th level to choose this affinity. While the likes of wizards and sorcerers command tremendous arcane power, few are as qualified to lead academies of arcane study or entire cabals of wizards as an arcana scion. Versed in arcane knowledge and gifted with unusual supernatural powers, arcana scions blend tactical knowledge and logistical know-how with the ability to grasp the very nature of magic and bend it to their will. Class Skills: A scion of arcana adds Knowledge (arcana) and Spellcraft to her class skills. Weapon and Armor Proficiency: A scion of arcana gains no additional weapon or armor proficiencies. A scion of arcana may choose from the following affinities. Arcane Blast (Su): Choose one element (acid, cold, electricity, or fire). As a standard action you may fire a blast of your chosen energy as a ranged touch attack. This blast has a range of 30 feet and deals 1d6 points of energy damage + 1 additional point for every 3 scion levels. If you spend one point of determination when using this ability it instead deals 1d6 points of energy damage per two scion levels. If a creature you attack with arcane blast reduces the damage it would do to 0 due to energy resistance or immunity you may spend one point of determination as an immediate action to regain one daily use of arcane blast. You may use arcane blast a number of times per day equal to 3 + your Charisma modifier. Arcane Magic: When you take this affinity you gain the ability to cast arcane spells from the magus spell list. You prepare and cast your spells as a sorcerer and your magus spells are based on your Charisma score rather than Intelligence. You determine your number of spells known and spells per day based on the tables below. However, you may only cast spells of up to 2nd level and spells of 3rd level and higher are not considered to be on your class spell list. Arcane Shield (Su): Choose one energy type (acid, cold, electricity, or fire). As a standard action you may erect a transparent sphere of your chosen energy around yourself, granting you energy resistance 5 to your chosen element. If you are struck by a melee attack from an adjacent creature you may discharge this effect, ending arcane shield prematurely, to inflict one point of energy damage per point of your Charisma modifier to the creature that struck you. If you spend one point of determination when you discharge arcane shield, you instead deal 1d4 points of energy damage per point of Charisma modifer to the attacking target. Arcane shield lasts for one round per scion level. You may use this ability a number of times per day equal to 3 + your Charisma modifier. Artificer: You gain Use Magic Device as a class skill. Additionally, you may cast detect magic as a spell-like ability at will, and may take item creation feats as well as teamwork feats as scion bonus feats. Cooperative Spell Knowledge (Su): As a full-round action you may grant one adjacent, spontaneous arcane spellcaster access to a number of your spells known of a total combined level equal to your Charisma modifier. The spellcaster treats these spells as being on his spells known list (and his class spell list at the same level the spells are for you.) So long as you spend a full-round action each round and your allied spellcaster does not move more than 5 feet from you, they retain this spell knowledge and may cast these spells using their own caster level and primary casting ability score. This does not allow a spellcaster to cast a spell of a level higher than he would normally be able to. Additionally, if you sit with a prepared arcane spellcaster (such as a wizard or magus) you can forge an eldritch bond with their mind, allowing them to scribe spells into their spellbook from your spells known as if you were a prepared spellcaster with a spellbook. You must be present during the entire scribing process, and any interruption ruins the attempt. The prepared spellcaster must still pay the normal costs for scribing a spell into their spellbook. You must have the arcane magic affinity and be at least 7th level to choose this affinity. Eldritch Student: You gain Linguistics as a class skill. Additionally, you may cast read magic as a spell-like ability at will, and may take metamagic feats as well as teamwork feats as scion bonus feats. Eldritch Trapfinder (Ex): You gain the ability to disable magical traps as a rogue with the trapfinding ability. To disable a magic trap you spend one point of determination and make a Spellcraft check rather than a Disable Device check against the trap's DC. You must be at least 4th level to choose this affinity. Familiar: You gain a familiar per the arcane bond ability as a wizard of your scion level. Greater Arcane Magic: You increase your ability to cast arcane spells. You gain the ability to cast up to 4th level magus spells as appropriate for your scion level. Spells of 5th level and higher are not considered to be on your class spell list. This affinity modifies arcane magic. You must have the arcane magic affinity and be at least 7th level to take this affinity. True Arcane Magic: Your ability to cast arcane spells becomes as powerful as possible for a scion. You may now cast arcane spells from the magus class list of up to 6th level, as appropriate for your scion level. This ability modifies greater arcane magic. You must have the greater arcane magic affinity and be at least 13th level to take this affinity. Runic Trap (Su): Choose an energy type (acid, cold, electricity, or fire) when you choose this affinity. As a standard action you may create a brightly glowing runic trap of that energy type, filling a five foot square within 30 feet. A character entering a space with a runic trap triggers it, dealing 1d6 points of energy damage to the triggering creature per 2 scion levels. A Reflex save (DC 10 + 1/2 your scion level + your Charisma modifier) reduces the damage by half. The rune magic trap persists for 1 round per scion level, or until triggered. If you spend one point of determination when using this ability you render the runic trap difficult to detect after being cast, requiring a Perception check (with a DC equal to the runic trap's save DC) to notice. A character capable of disabling magic traps can disable a runic trap with a successful Disable Device check against a DC equal to the save DC of the trap. You may use this ability a number of times per day equal to 3 + your Charisma modifier. Scions of intrigue come from many backgrounds, be it as a spy working within a royal court, to a canny thief climbing the ranks of an infamous guild. These clever individuals utilize cunning and subterfuge to accomplish their goals and are ultimately suited to become spymasters and guild leaders in their own right. Class Skills: A scion of arcana adds Sleight of Hand and Stealth to her class skills. Weapon and Armor Proficiency: A scion of intrigue gains proficiency in the shortsword, shortbow, whip, and hand crossbow and with bucklers. A scion of intrigue may choose from the following affinities. Alter Ego (Ex): You gain Disguise as a class skill and may use social maneuvers to modify your Disguise check. Additionally, you develop an alternate persona to masquerade as. Once the details of this persona have been decided they cannot be changed. If you attempt to disguise yourself as a different person you do not receive the benefit of this affinity for that Disguise check. You gain a bonus on Disguise checks equal to your inspiring leadership bonus to appear as this persona. Each time you select this affinity you may create another alter ego. Cruelest Cut (Ex): Whenever you successfully use Diplomacy to successfully influence a creature's attitude you may spend 1 point of determination to deal sneak attack damage (regardless of whether or not the target is denied his Dexterity bonus or not) on all attacks made against the influenced creature for one round. You may continue to spend determination to make sneak attacks for up to one minute after successfully influencing your target. You must be at least 7th level to choose this affinity. In the Name of (Ex): You may make a Diplomacy check to affect a creature's attitude towards another target, even if they are not present at the time. You may also choose to influence attitude negatively as many steps as you would have influenced attitude positively on a successful check. Information Network (Ex): You gain access to a network of informants and spies that can aid you in gathering information while in a settlement. Choose one settlement modifier when you choose this affinity (corruption, crime, economy, law, or society.) When you make a Diplomacy check to gather information you gain a bonus on your check equal to the chosen modifier of the settlement and your inspiring leadership bonus. Each time you choose this affinity you choose a different settlement modifier. Legendary Renown (Ex): You add your inspiring leadership modifier to your total fame scoreUC to determine awards available in any organization you are a member of. Master Rogue Talent (Ex): You may choose a master rogue talent. Use your scion level as your rogue level to determine the availability of master rogue talents. You must be at least 10th level to choose this affinity. Of Two Minds (Su): You have trained yourself to fool divination magic when in disguise. Whenever your alter ego would be subject to a divination spell, the caster must succeed at a caster level check (DC 10 + 1/2 your scion level + your Charisma modifier) or receive false information. The nature of this information is based on the identity of the alter ego being targeted. Each time you take this affinity it applies to a different alter ego. You must have the alter ego affinity and be at least 7th level to choose this affinity. Rogue Talent: You may choose one rogue talent that you qualify for. Treat your scion level as your rogue level for determining qualifications. Revealing Observation (Ex): When you observe a creature within 20 feet per scion level that you have line of sight to for 1 hour, you may make a Perception check to determine helpful information from the target's actions. Compare the result of your Perception check against a DC of 10 + your target's Stealth modifier + special modifiers on the table below. The more unlikely it is a target would reveal dangerous information, the more difficult it is to discover through observation. Slip Away (Ex): As long as you are adjacent to another creature you may attempt a Stealth check to hide as if you had cover from every creature except the one you are using to slip away. So long as you end your turn adjacent to another creature or behind cover you may continue to use Stealth to hide. You must be at least 4th level to choose this affinity. Sneak Attack (Ex): You gain the sneak attack class feature of the rogue. Your sneak attack deals 1d6 points of damage at 1st level and an additional 1d6 points of damage at 4th level and every 4 levels thereafter. Master of Masks (Ex): So long as you are wearing a mask that covers your face you may use your Stealth modifier in place of your Disguise modifier to conceal your identity. Any ability you have that modifies Disguise checks still applies to this special Stealth check. Additionally, you can use your ranks in Stealth instead of Disguise for meeting prerequisites. I’m surprised that they were able to rollout the game so quickly with all of the designing, editing and creating features taking just two days.